Best for stir-fried vegetables. Ideal for marinades, soups and as seasoning for fried dishes. 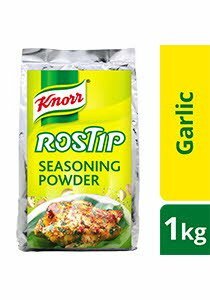 Use 15 g of Knorr Rostip Chicken Seasoning Powder for a 1 kg dish preparation. Best for seasoning chicken dishes or for marinades, may also be used to season broths.